The world is starting to get a better idea of what the U.S. military's proposed new space plane might look like. 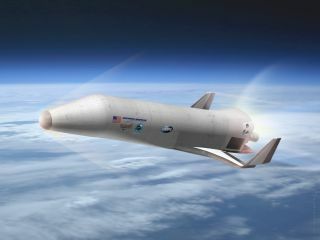 This week, aerospace firm Northrop Grumman released artwork depicting its conception of the XS-1 space plane, which it's designing under a $3.9 million contract from the U.S. Defense Advanced Research Projects Agency (DARPA). Northrop Grumman is one of three companies competing for the right to build the unmanned XS-1, which is short for "Experimental Spaceplane." The other two are Boeing and Masten Space Systems, both of which also won yearlong "Phase 1" initial design contracts in July. DARPA wants the XS-1 to make spaceflight much more routine and affordable. The reusable vehicle should be able to fly 10 times in a 10-day span and launch 3,000- to 5,000-lb. (1,361 to 2,268 kilograms) payloads to orbit for less than $5 million per flight, officials have said. XS-1 will probably feature a reusable first stage and one or more expendable upper stages. The first stage will fly to suborbital space at hypersonic speeds, then return to Earth to be used again; the upper stages will deploy payloads to orbit. Northrop Grumman is teaming with other aerospace companies on its design, tapping Scaled Composites to head manufacture-and-assembly work and Virgin Galactic to lead XS-1 operation. "Our team is uniquely qualified to meet DARPA's XS-1 operational system goals, having built and transitioned many developmental systems to operational use, including our current work on the world's only commercial spaceline, Virgin Galactic's SpaceShipTwo," Doug Young, vice president for missile defense and advanced missions at Northrop Grumman Aerospace Systems, said in a statement. "We plan to bundle proven technologies into our concept that we developed during related projects for DARPA, NASA and the U.S. Air Force Research Laboratory, giving the government maximum return on those investments," he added. Northrop Grumman is not alone in reaching out to other firms for assistance in developing an XS-1 design. Masten is working with XCOR Aerospace, and Boeing is teaming with Jeff Bezos' secretive firm Blue Origin. DARPA expects to hold a Phase 2 competition next year to see which company makes it to the flight-test stage of XS-1 development. (The agency only has enough money for one XS-1 contractor in the end.) Officials currently envision that the first orbital mission of XS-1 will take place in 2018.